I had been out been out Silverbell Rd. on the other side of Ragged Top Mt., with my son, niece and her husband last weekend. I hadn’t been out that way before. Actually none of us had. The Silverbell Mine has created a huge scar there. All I can say positive is that the mountainous piles of rubble that have buried the landscape have some beautiful color in them from the geology that they have uncovered. 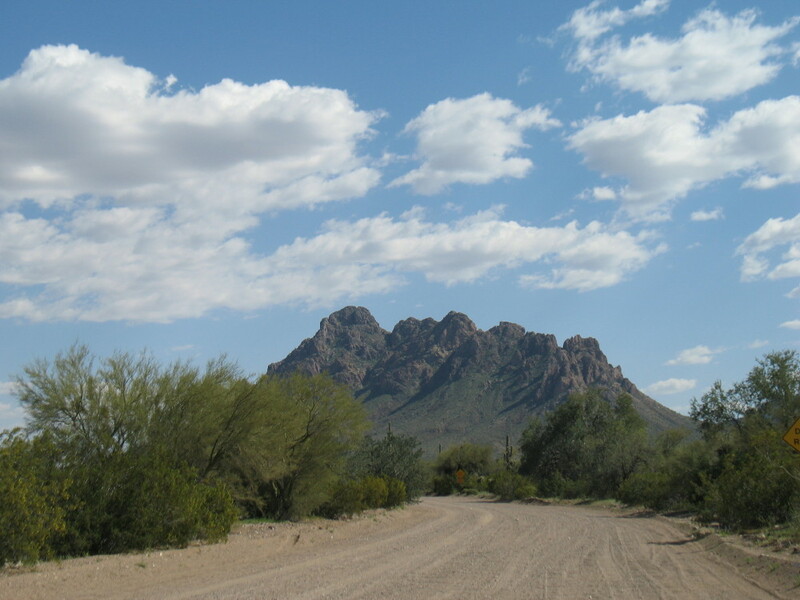 Directly on the other side of the road, however, there is a beautiful pristine desert which stretches for miles to the west and into the Tohono O’odham Reservation. 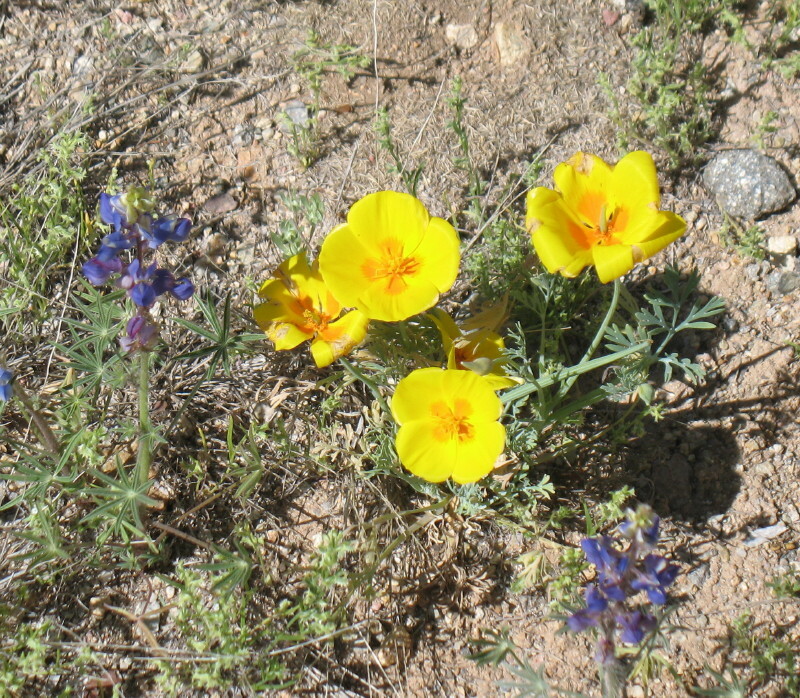 As we toured slowly on this very rough back road, we began to see desert blooms, bluebell, desert poppies, and others congregated in fields amongst the larger desert plants. It was quite a show at places. The rains this year had been good to us all. 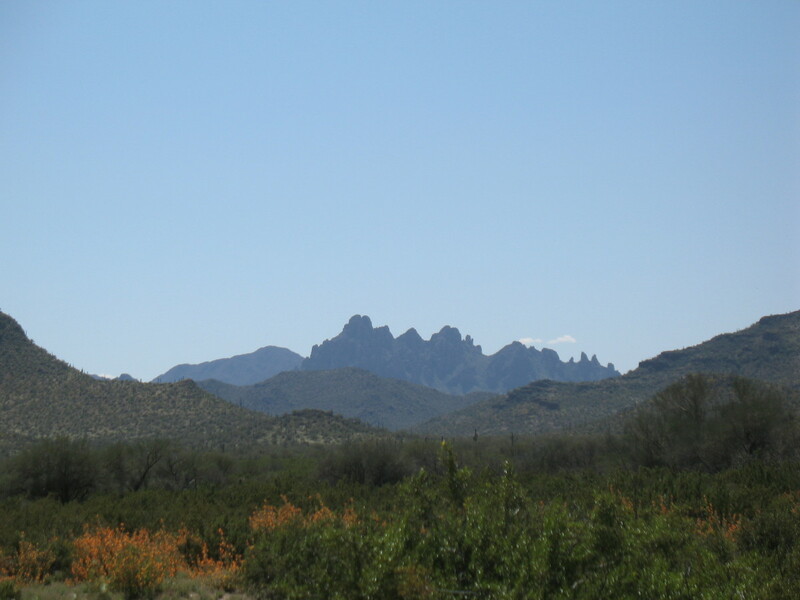 We had continued on to the old Redrock smelter and then circled Picacho Peak, just to explore. There were fields covered with orange glowing mallow. I hadn’t seen masses of this before. The desert blooming was just getting started. 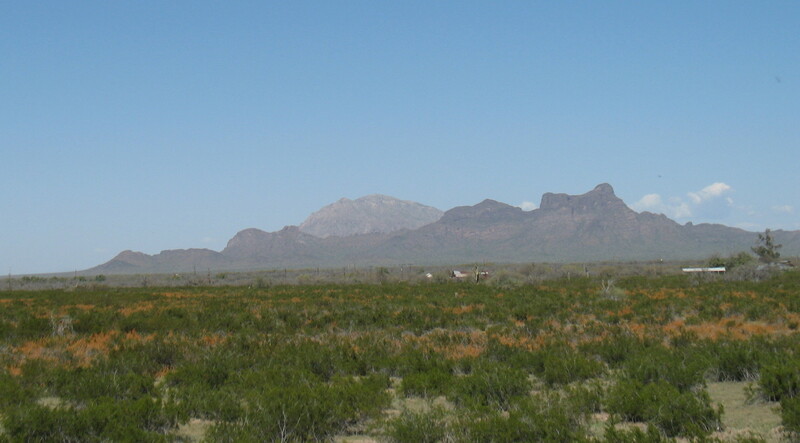 Picacho Peak in the distance. I told DF about this and invited her out Friday night to my place for diner and a movie, so that we could get an earlier start Saturday morning to see the display. That morning, we pumped the gas, cleaning the windows real good, stripped in the parking lot and headed out on the long road west to the Ironwood Monument desert. This time, we took the road out to the north of Ol’ Ragged Top and the Ironwood National Monument. We saw few blooms along the road. Things are just starting out, but she knew that I knew where the flowering was abundant. We coursed through the desert on old familiar roads. I had owned property out there in the later seventies. The roads had been paved, patched, re-patched and now, in disrepair. There were more homes out there, but when we hit the dirt in Ironwood National Monument, it became something else. 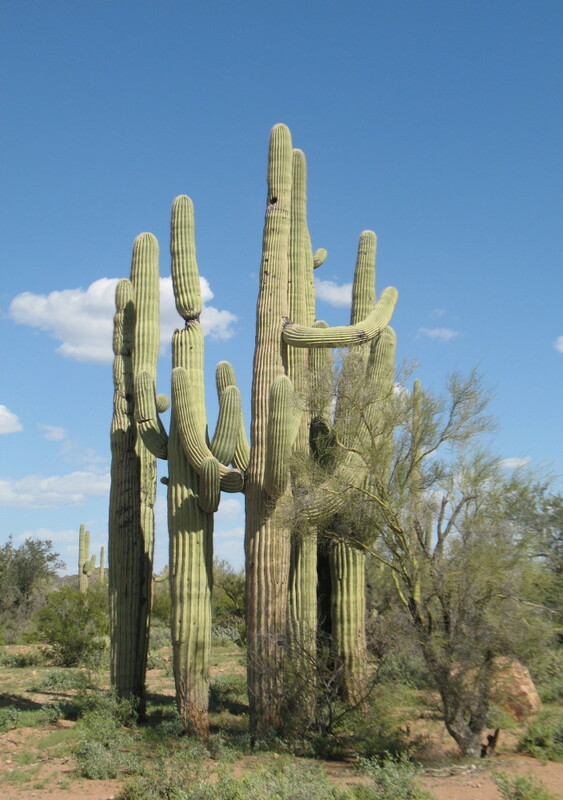 There was no abundance of blooms, but the clean protected forest of ironwood trees with its saguaros of infinite personalities was delightful. There is a nice carpet of low growing plants from the rains, which have the look of grass lawns. The reddish soil highlights in contrast. 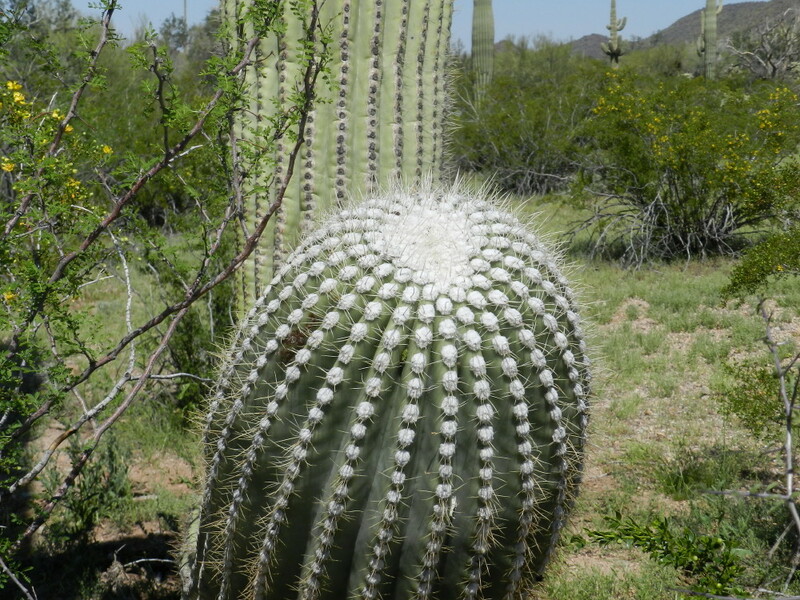 This is Sonoran Desert at its best. The vibe was a healthy natural environment. I had spotted a road off of Silverbell Road the week before and rechecked on the google satellite map. It appeared to go out for many miles. It is just a jeep trail, a set of tread marks, with little to no grading. I drove down another road, thinking that I had found that one, but it ended in a driving circle. A campfire circle sat at its center. It was a perfect spot, so I pulled in under a tree’s shade. We decided to do a short walk-about, taking only one bottle and no snacks, just to begin with a quick reconnoiter in our excitement to explore. Step by intriguing step, it became over two hours of exploration. One thing leads to another. We decided to wander through the green fields that were before us, where we would not have to climb through thick vegetation. After a couple of deep washes, these led us over a crest. All along, we found blooming flowers. They were generally just tiny little things that bloom in these circumstances among ground cover. We found around twenty different types of flowering plants there. We generally had them under feet, attempting to dodge them. Respectfully, lovingly, we attempted to not to step on their abundance and tenacity. It was fun and fascinating. This evident diversity isn’t there most of the time, but can explode when conditions are right. As we continued, looking down mostly, DF noticed stones of multiple crystals. We picked a few up. They were beautiful. Then she spotted one that was a very familiar look to us. It was a fire agate, a gem stone. They were all around. We continued up a hill, back down and then into a large wash. It was one wonderful experience after another. The silence was deafening. It was great to empty thoughts and just wander in this peaceful corridor. Occasionally, we would stop and wait. We would hear the wind blowing in the distance, then we would see it affecting the plants as it crept up on us, getting louder, until it finally reached us, informing our bare bodies of the presence. It was like an event. We watched and listened, as one would a passing car. Our conversation, what little there was, would stop as our attention was distracted by the notable traveling winds. We found a large wash to use as a wide trail. We took a walk further down it, until deciding to return. DF told me that she was getting hungry and the water was half gone. It was time. We had spontaneously wandered naked into the fascination of the desert much further than intended. We had a fine lunch of some chili that I had made out of avocado, almonds and spices. We dipped blue corn chips, apples and carrots into it. We had almonds and other snacks off to the side. We sat in our chairs in the shade and soaked it all in. This was a very special place. 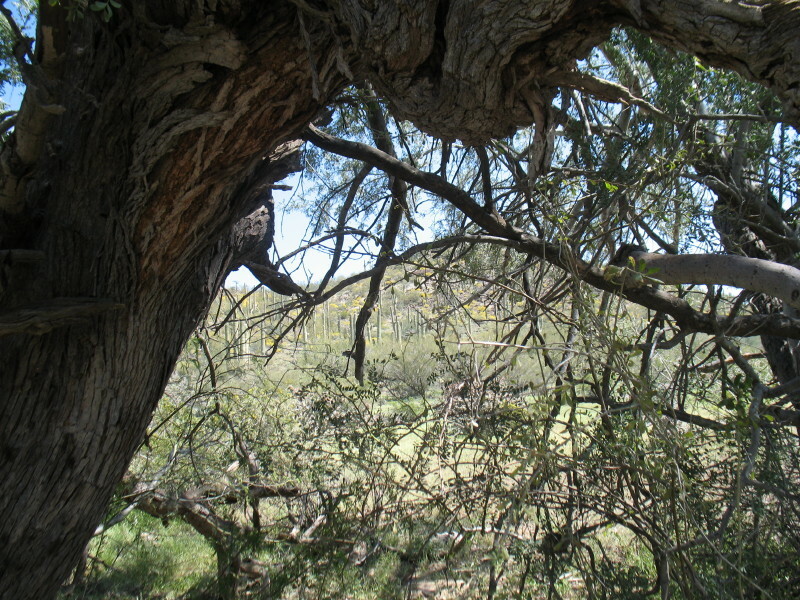 There is plenty of room to hike, it is pleasant and spiritual. It will be a good place to return to, camp in, and enjoy, leaving clothing behind. 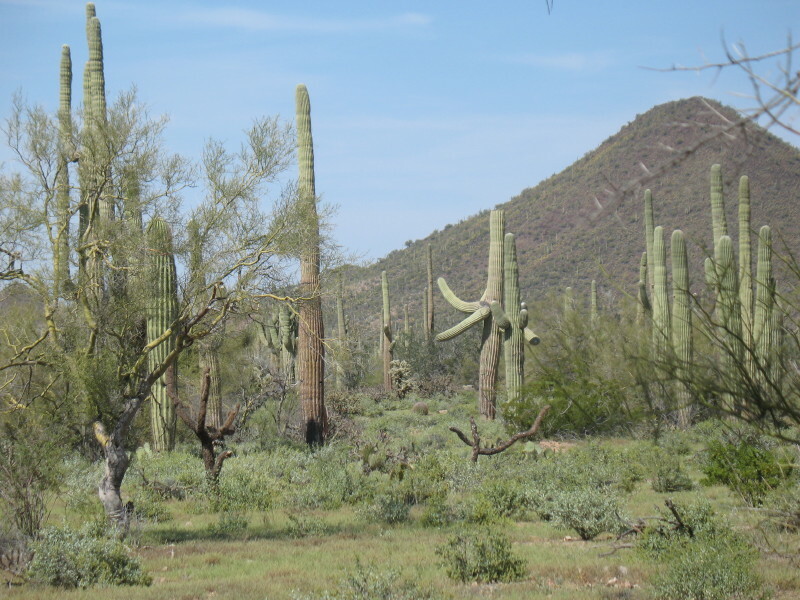 We drove down the road a bit more, to where I had seen the meadow-like fields of flowers among the saguaro, creosote, palo verde and cactus. From there, I drove back differently and we found those fields of florescent orange mallow. Carnuding, I was reminded of the incident many years ago at Ragged Top, when my clothes had been locked accidentally in a van, an hour’s drive from home. I’ll have to publish the story here, soon. This had been a good day. Do you think those roads out there, other than the jeep trails, are ok for a 2-wheel-drive SUV? I’ve long been curious about Ragged Top, having seen it from I-10, of course, and soared near it once with a pilot friend. Your photos remind me to explore more. I anticipate and enjoy every report you issue, and am looking forward to your story about the locked-in-the-van clothes. I have to be careful because my Suzuki Grand Vitara sometimes locks itself after a minute or two when the windows are up and there’s nobody inside. I’ve studied the manual, messed with the child-lock switches, and searched the web to no avail. A few years ago, packrats chewed a couple of wiring harnesses up front, which I repaired, but maybe something got mixed up electrically in some other way. It seems unlikely that the car was designed to do that. You once wrote that we may already have met. I wonder if you are a friend & neighbor of a couple who, with a lot of help from friends, built their own adobe house in your area 20 years ago, with a garage that could accommodate an old diesel bus, hauled their water with an old tanker, and used to throw a big pit-barbecue party every Labor Day for those who helped build the house. A friend and I were a two-man country/rockabilly band for many of those parties over the years. Maybe you were there. Unfortunately, it’s been nearly a decade since the last gathering. It was fun, but a lot of work for them. Yes, the roads around Ragged Top are all graded, The slope where we went off road was a piece of cake. Maybe more clearance than a Honda Civic, but nothing very dramatic. You’ll need to drive slowly through the washes on the back and south side, or get a big bump on your head. Yes, the goat roasting pit. I remember it well. That was back in the Town of Tortolita days.